Dumping syndrome. It sounds like a fictional sickness from a children’s cartoon or TV sitcom. Unfortunately, that’s not the case. Dumping syndrome is very real, and if you’ve had some stomach issues or recent stomach surgery, you may want to pay attention to this. In this article, we are going to tackle all of the ins and outs of dumping syndrome, and how it affects your health. From the causes and symptoms of dumping syndrome, to the diets and treatments, this article should help prepare those who currently have dumping syndrome and anyone who may have dumping syndrome in the future. Early dumping syndrome: when the food is dumped into the small intestine within 10 to 30 minutes of eating. Late dumping syndrome: when the dumping into the small intestine occurs after two to three hours after eating. Sounds pleasant, doesn’t it? While dumping syndrome may sound a bit on the dramatic side, its causes are relatively mundane. The answer to what causes dumping syndrome is a bit of a two-part answer. For the most part, it is caused by gastric surgery. The surgery creates certain imbalances in the stomach that lead it to dump the food early. Now, there are different triggers for the two types of dumping syndrome. In the case of early dumping syndrome, the dump is usually triggered by liquid rapidly moving into the intestine as a large amount of food suddenly hits the stomach. Late dumping syndrome is prompted by the rapid movement of natural fruit sugars and added-sugar foods, which end up causing the pancreas to create more insulin. This, in turn, can cause your blood sugar to rapidly drop. With all of these unpleasant symptoms, you are probably curious about what you can do to alleviate them or improve your entire situation. One of the best ways is through diet. One of the key ways you can help is to alter your diet for dumping syndrome. These dietary changes not only include foods you should avoid and foods you should eat, but they also include changes in the way you consume foods. The following are good tips to remember. Most of us are almost trained in the idea that we eat three relatively large meals a day. If you are suffering from either form of dumping syndrome, you will benefit from eating smaller meals five or six times a day. 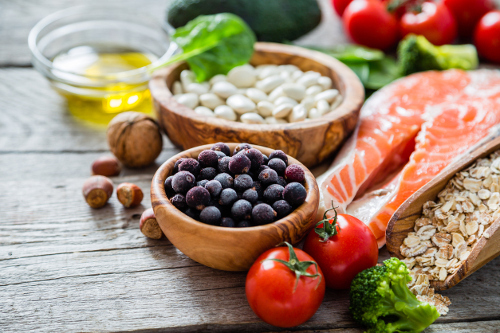 Change your diet by adding more protein (lean meat, poultry, and fish), complex carbs (oatmeal), foods in high in fiber, and whole grains. Try to avoid foods that contain large amounts of sugar like candy, juices, syrups, and sodas. Dairy products may also give you issues due to its natural sugar content. Also, a change that may take a little getting used to, avoid drinking liquids with meals. Instead, drink the liquids 30 minutes before or after a meal instead. The more your food is chewed up, the easier it is to break down before heading to the small intestine. While eating may tire you out if you are suffering from dumping syndrome, try to avoid lying down after eating, as it can cause issues. In addition to these, there may be some vitamins to take to help remedy the loss of nutrients due to fact that your body isn’t digesting food in a proper manner. However, this will differ from person to person. It is best to check with your doctor about what vitamins you may be losing and need to be replaced. In terms of home remedies and alternative medicines for dumping syndrome, not a substantial amount can be offered to help you out. Some people will take food additives like guar gum, pectin, black psyllium and blond psyllium as a way to thicken your stomach’s contents, allowing the food to digest relatively naturally. With traditional medicine, your options are similarly limited. There are medications that you can take such as octreotide. And for rather stubborn cases of dumping syndrome, anti-diarrhea medication may be used to slow your digestive system down. As a last resort, there are also a few surgical options that can be used to restrict the speed at which food goes from the stomach to the lower intestine. Keep in mind, this is for fairly dire situations where the condition is not clearing up with the use of diet changes. The Dumping Syndrome Diet Can Help! How long does dumping syndrome last? In some ways, it is up to your body. More often than not, dumping syndrome will go away on its own. But if you institute some the dietary and lifestyle changes we outlined previously, you may find that it helps the process, and your problem clears up within three months or so. Besides, adding more fiber and protein to your diet is generally good advice regardless of the situation. If you’re not sure about any of it, consult with your doctor to make sure you are on the right path to curing your dumping syndrome. This will also keep you on top of any issues, like vitamin deficiency, that the syndrome may be causing. Hopefully, you will be out of the woods in no time. “Gastric dumping syndrome,” Wikipedia; https://en.wikipedia.org/wiki/Gastric_dumping_syndrome, last accessed June 28, 2017. “Dumping Syndrome,” Nation Institute of Diabetes and Digestive and Kidney Disease; https://www.niddk.nih.gov/health-information/digestive-diseases/dumping-syndrome, last accessed June 28, 2017. “Dumping Syndrome,” Mayo Clinic; http://www.mayoclinic.org/diseases-conditions/dumping-syndrome/basics/definition/con-20028034, last accessed June 28, 2017. “Dumping Syndrome,” WebMD; http://www.webmd.com/digestive-disorders/dumping-syndrome-causes-foods-treatments#1, last accessed June 28, 2017. “Dumping Syndrome Diet,” UPMC, November 2010; http://www.upmc.com/patients-visitors/education/nutrition/pages/dumping-syndrome-diet.aspx, last accessed June 28, 2017.